These freezer-friendly baked meatballs are totally delicious and perfect for swedish meatballs, spaghetti, and more! With a bright and fresh fridge and freezer, there's no better time to start stocking up on all my favorite freezer foods! Having pre-cooked food in the freezer totally saves me on those nights I don't feel like cooking (which, let's face it, is most nights). Having the protein already cooked means that I can pull dinner together in a snap! These baked meatballs are some of our favorites. They're delicious and versatile, and perfect for using in some of our favorite recipes, from swedish meatballs to spaghetti. My kids will even eat them plain as a main course, with some fresh fruit and roasted vegetables on the side. I've added a recipe below for 1 pound of ground beef (although you could easily substitute ground turkey), but feel free to double, triple, or quadruple the recipe. 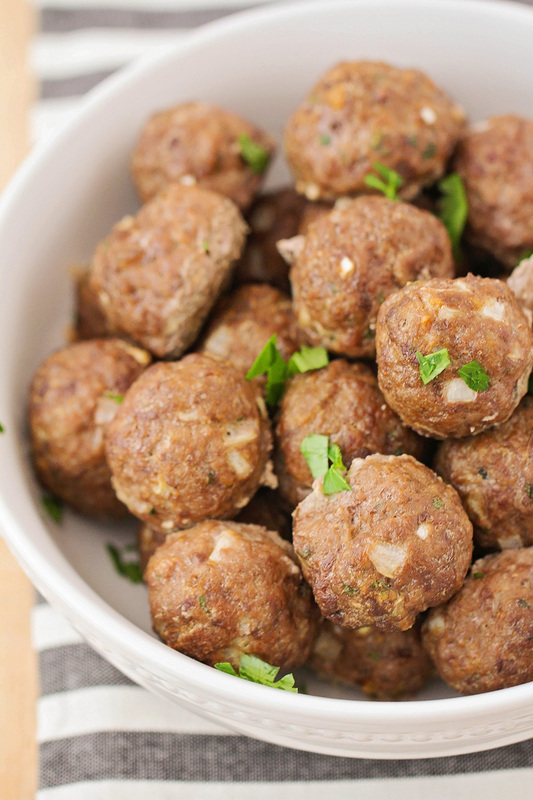 I like to make a huge batch, then portion them into freezer bags with enough meatballs for one meal for my family. These baked meatballs are always very popular at my house! Preheat the oven to 375. Line a baking sheet with foil and set aside. Combine all ingredients in a medium bowl. Mix well, then shape into one inch balls. 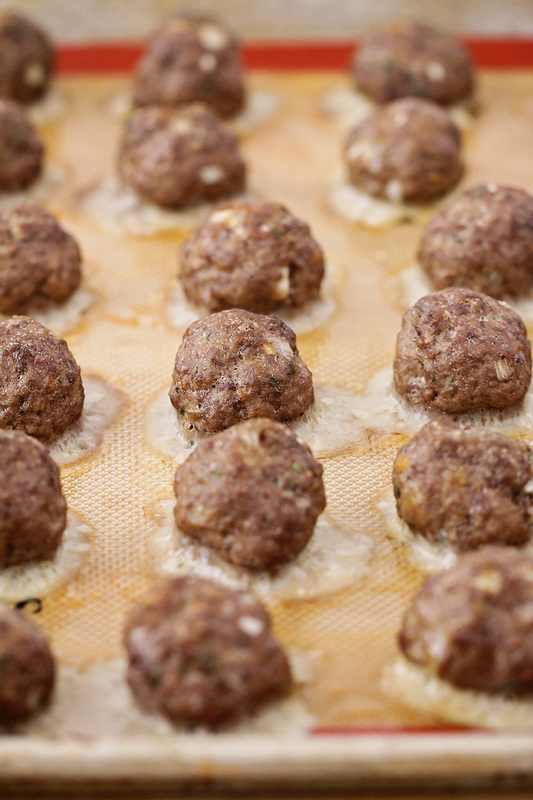 Place the meatballs on the prepared baking sheet. Bake 25 minutes, or until browned and cooked through. Let cool completely, then place into freezer bags and freeze. 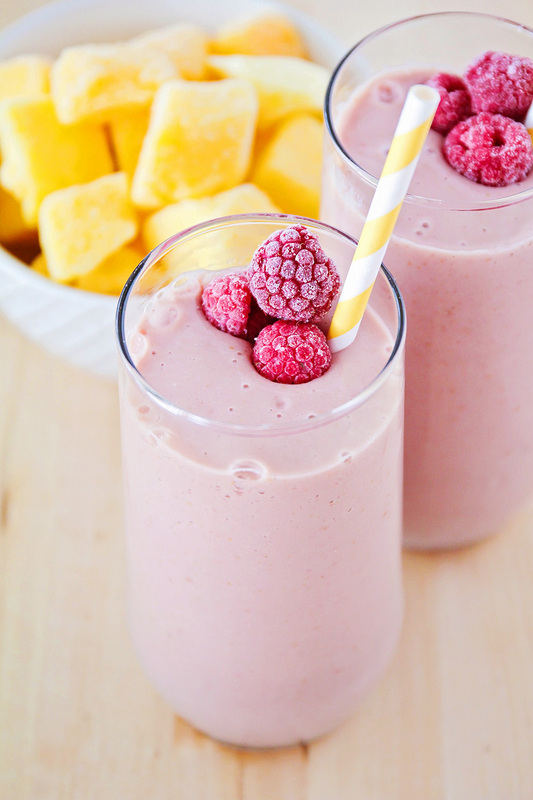 This refreshing and healthy mango raspberry smoothie is the perfect easy breakfast! I mentioned a few weeks ago that I had made some healthier goals for the new year, and I've kind of been shocked at how easy it has been to stick with them! It turns out that I actually have a lot more willpower than I had previously thought. (Who knew?) I think it helps that I'm starting with small, achievable goals. For January, my goals are to close all the rings on my apple watch daily (which includes 30 minutes of exercise), to drink water instead of soda, and to eat 5 servings of fruits and vegetables every day. Each month, I'll add a few more small goals, and continue working on the goals from the previous months. I'm hoping it's a system that will be easy to stick with, and I'll end the year feeling happier and healthier. So far so good! I've been trying to get my whole family on board with the 5 fruits and vegetables per day thing, and so far things are going pretty well. I always put at least one fruit or vegetable (usually two) into the kids' lunches for school. Some of their favorites are apple slices, grapes, applesauce pouches, sliced strawberries, baby carrots, snap peas, and celery sticks. Since we're so busy in the morning and don't usually have a lot of time to eat breakfast, I started making smoothies for the girls most mornings, and it has been awesome! I love that they can drink their breakfast in just a few minutes, and they're also getting a serving of fruit before they leave for school. They both get a snack in the morning at school, and they eat lunch around 11:00, so a smoothie is plenty to tide them over until snack time. We've tried a variety of frozen fruit in our smoothies, and the girls love pretty much everything! 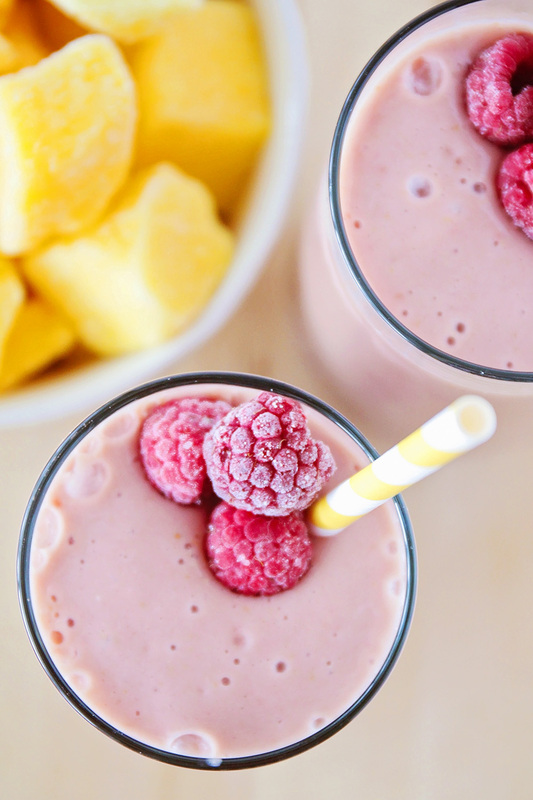 This mango raspberry smoothie is one of our favorites, though. 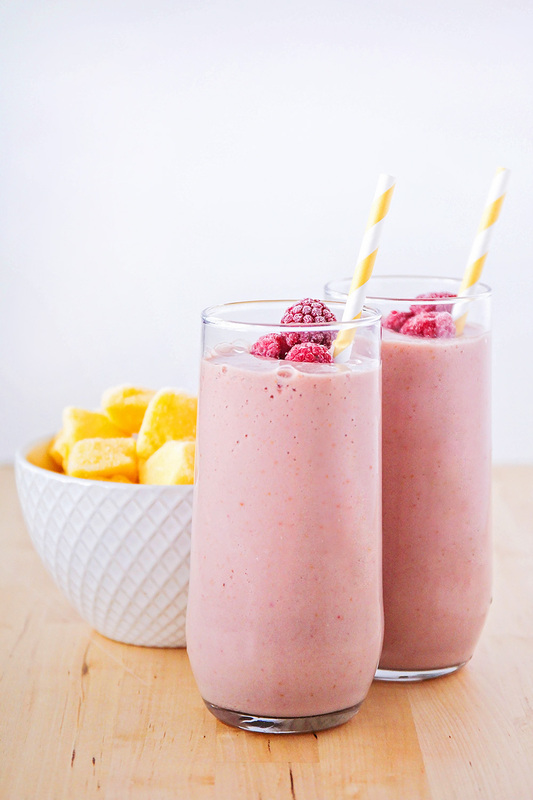 The sweet mango plays off the tart raspberries nicely, and pink smoothies are always a win with my girls. :) We love to use vanilla soy milk in our smoothies to add a little flavor, but you could definitely use dairy milk or juice instead. The banana is a must for sweetness and a smooth creamy texture! I also like to throw in a little flax seed in my smoothies because my kids don't notice it at all, but it adds a little more nutrition. We've made this smoothie multiple times over the last few weeks, and it's always a favorite! Add the bananas to a blender, then layer the frozen fruit on top. Pour the soy milk over the top, and blend until smooth. Serve immediately. 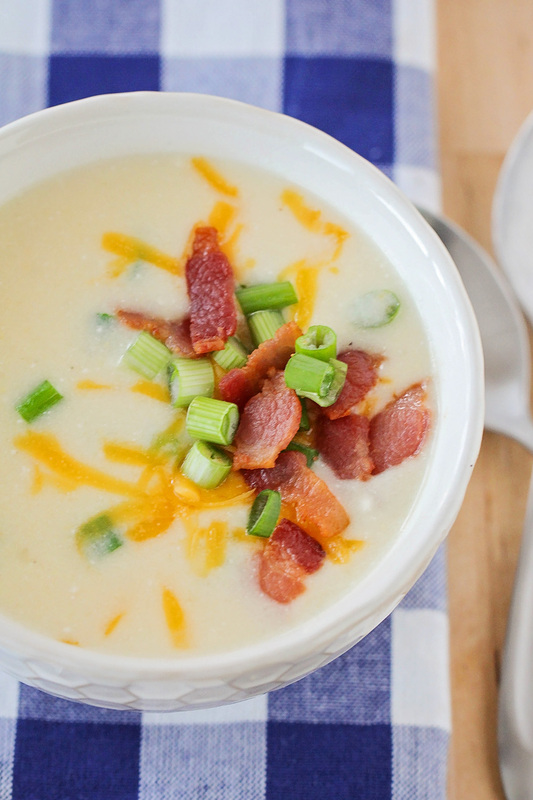 This loaded baked potato soup is quick and easy to make, and so delicious! 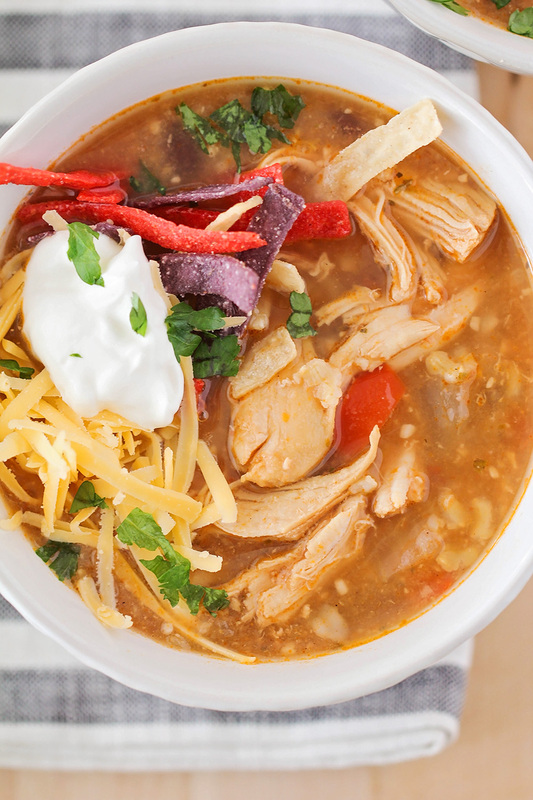 The perfect cozy meal for a cold night! After the snowpocalypse last year in Portland, I was bracing myself for another tough winter this year. So far, though, it has been incredibly mild. We've had some rainy days (although less than usual, it seems) and only one icy/snowy day so far. This last week has been beautiful, and we've had several sunny days in the mid-50s. We've been taking advantage of the great weather and spending as much time as we can playing at the park and soaking in all the sunshine we can get. My kids have decided that it's just spring already, and have been asking if they can wear shorts to school. (I don't really have the heart to tell them that we're heading into a few weeks of rainy and cold days. Sorry kiddos!) As excited as I have been to have these sunny spring-like days, though, I'm still not ready to give up my winter soups! 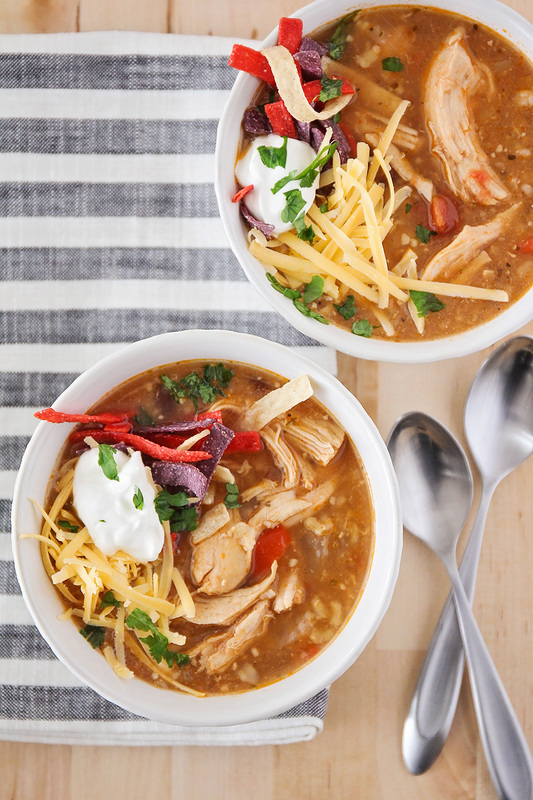 There really is nothing better than a warm bowl of soup on a cold night. 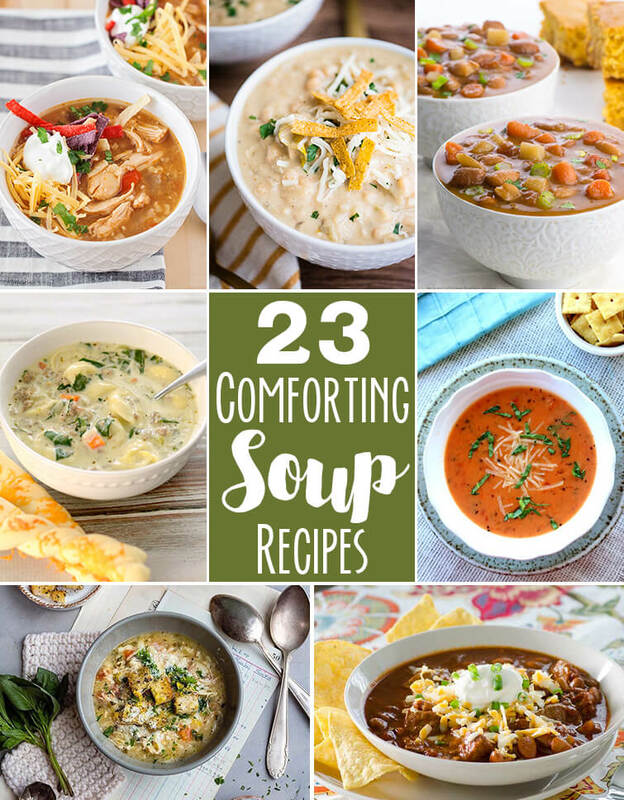 Soup is my favorite form of comfort food, and I would gladly eat it every night of the week. 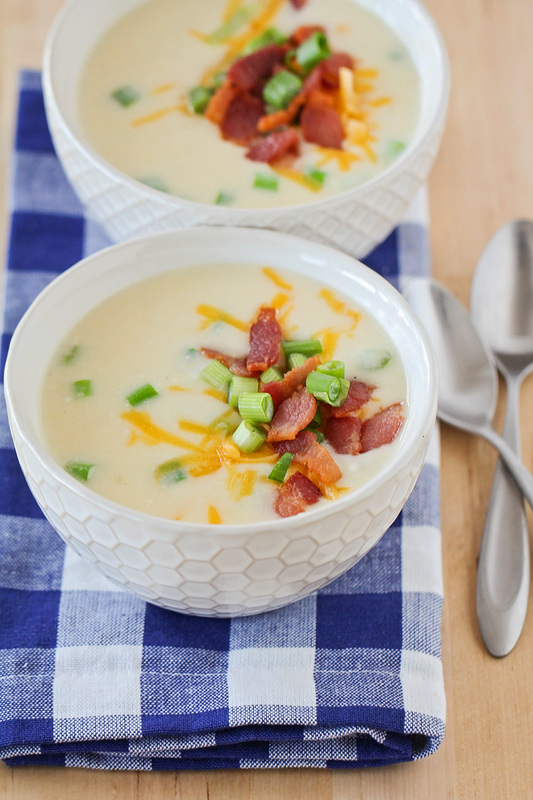 This baked potato soup is one that I've been making for years now, and it's always a big hit! Everyone I have made it for has loved it, and I love that it's quick and easy to make. Cooking the potatoes beforehand in the microwave gives it that baked potato flavor and texture, but it also speeds up the cook time so the soup is ready in about thirty minutes. 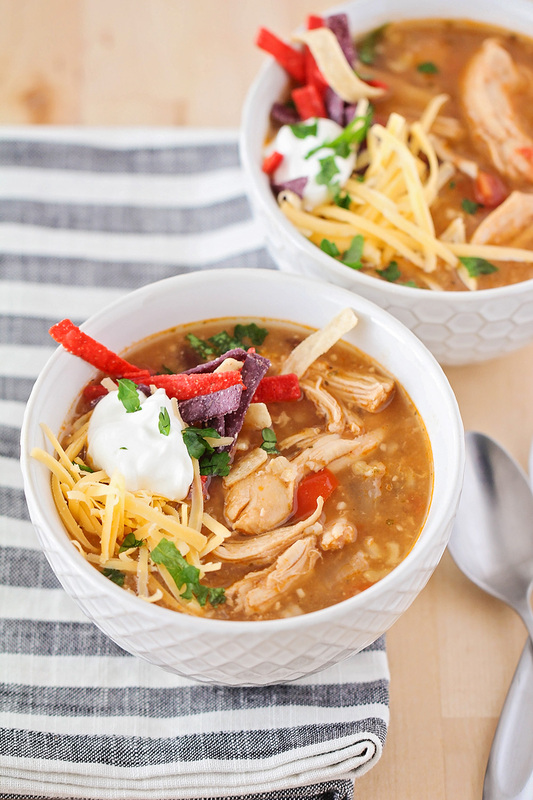 It's perfect for a busy night when you still want something tasty and filling for dinner! Microwave potatoes until cooked through. Remove from the microwave and let sit until cool enough to handle. Remove the potato skins (they should peel off easily), then cut the potatoes into small chunks. Melt the butter in a large soup pot over medium heat. Add the flour, and whisk until combined. Cook, stirring constantly, until golden brown, about 2 minutes. Whisk in the milk, stirring constantly to prevent lumps. Whisk in the chicken broth, and bring to a simmer. Cook until thickened and bubbling, about 10 minutes. Mix in the potato chunks. Remove from heat and whisk in the salt, pepper, cheddar cheese, green onions, and sour cream. Serve immediately. Garnish with sour cream, cheddar cheese, green onions and bacon as desired. 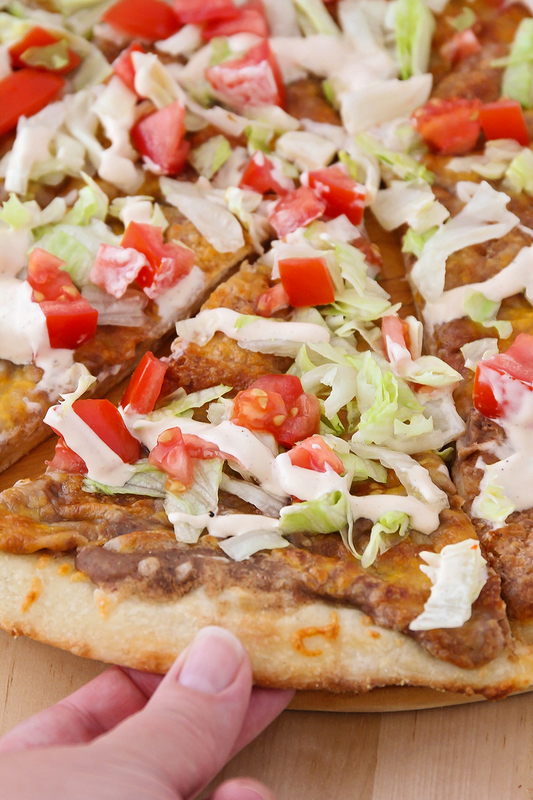 This cheesy tostada pizza is a delicious meatless meal that's super easy to make! Hey friends! It's been a minute. I hope your new year has been wonderful so far! I've been really excited to get started on my goals for the new year, and so far (11 days in) things are going great! I mentioned before that we are hoping to buy our first home this summer, and so we are trying to save every penny that we can for a down payment. I'm also working on some healthier habits, including (gasp!) giving up my beloved Diet Coke, getting enough sleep, and meeting my exercise goal every day. My reward has been that I've been feeling great so far this year! So great, in fact, that I haven't wanted to sit down at the computer and work. :) As fun as it has been for me to spend the last few weeks re-watching old episodes of Doctor Who and going for walks at the park with my husband, it means I have totally neglected to share this tostada pizza with you, which is an absolute shame. Since I absolutely love both easy dinner ideas and homemade pizza, this pizza is right up my alley! It's super quick to make (less than thirty minutes) and is full of flavor. My kids love it, and my husband does too! He was a little skeptical the first time I tried to feed him pizza with fresh salad on top of it, but after a few bites he was totally sold. The savory beans and cheese are the perfect contrast to the fresh lettuce and tomatoes, and the ranch/sour cream mixture on top helps to tie everything together. This is one of our favorite pizzas, and we make it often! Preheat the oven to 500 with a baking stone or overturned cookie sheet inside. Spread the dough out to form a large circle. In a small bowl, mix the refried beans with the garlic, cumin, and chili powder. 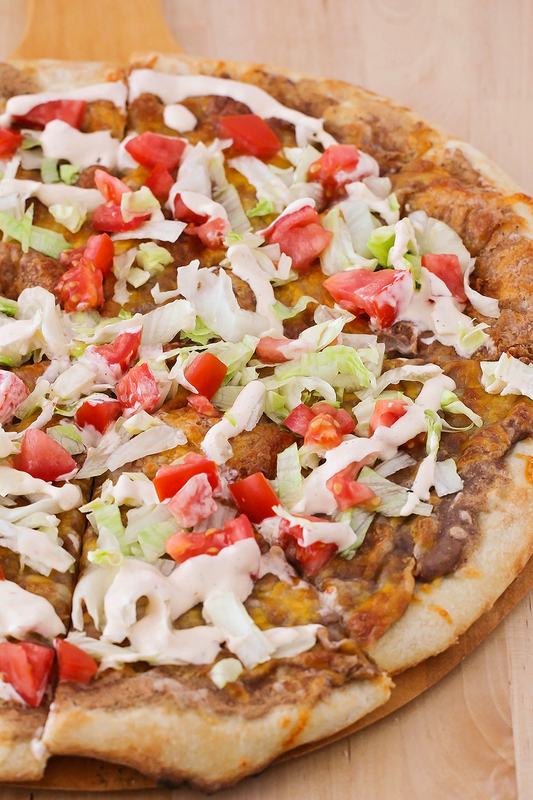 Spread the refried beans over the pizza crust in an even layer, then sprinkle the cheese over the top. Bake 7-9 minutes, or until the crust is golden brown. In a small bowl, mix together the sour cream and ranch dressing. Sprinkle the lettuce and tomatoes over the top of the pizza, then drizzle with the sour cream mixture. Serve immediately.